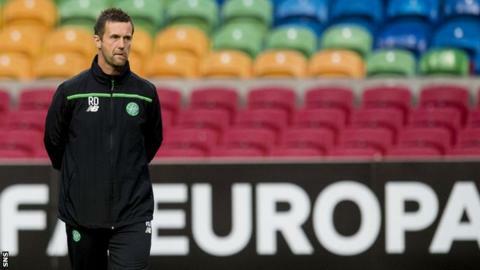 After Ronny Deila said his piece at the Amsterdam Arena on Wednesday evening ahead of Celtic's Europa League opener against Ajax - fighting talk about togetherness and bravery and their desire to win as opposed to just surviving - the mind drifted back a couple of years to a scene in the exact same room in the bowels of the exact same stadium. It was November 2013 and his predecessor, Neil Lennon, was letting rip at his failing players. Lennon had just watched his team lose 1-0 to Ajax in a Champions League group game and even though his words weren't for quoting at the time, there was no mistaking the anger with which they were spoken. Principally, Lennon was railing against the ineffectiveness of his attacking players and his inability to bring in a player - or players - who might give his side more of a cutting edge up front. In that moment, he lacerated Georgios Samaras, and others, and said he needed greater artillery if he was going to stand a chance of competing at the elite level of European football. Lennon had a point, but he also had a problem. Sitting on the bench that night were Derk Boerrigter, Teemu Pukki and Amido Balde, three attacking players that were signed on his watch for multiple millions and zero return. The money might have been wasted, but it was real and he didn't do enough with it. It's worth putting that defeat in context, though. Ajax had been champions of Holland for the previous three seasons and would, some months after beating Celtic, make it four-in-a-row. They were no great shakes but they were good enough to beat Barcelona in Amsterdam in that same Champions League group as well as drawing away with AC Milan. The fact that Lennon railed against a narrow defeat away from home against a team such as Ajax showed you where Celtic were at back then. Their standards and expectations were high, but Lennon could see them falling. The season before, 2012-13, his team had gone to Spartak Moscow and won. They went to Camp Nou and until stoppage time, and a late winner from Jordi Alba, they were drawing 1-1 with the Barcelona of Xavi, Iniesta, Alexis Sanchez, Messi and Pedro. They lost most of their away games in that campaign but they were competitive animals none the less. They were defeated by a goal in Benfica, who boasted Nemanja Matic, now of Chelsea, and two players who would later start for Argentina in the World Cup final - Ezequiel Garay and Enzo Perez. They lost 2-0 in Turin to the Juventus of Pogba, Pirlo and Vidal. They lost to Milan in the San Siro to two goals in the last eight minutes. Celtic were dogged then. Sure, they shipped the occasional heavy beating, but in that brief time they rubbed shoulders with the best and were competitive for the most part. And glorious at times. Now it's different. Now they go to Malmo and lose by the same score as they did in Turin and Milan. Now they concede four goals over two legs to a moderate Swedish team - and four in 90 minutes to Dinamo Zagreb last season - where before they conceded three in 180 minutes-plus against the mighty Barcelona. The only point in harping on about the recent past is to illustrate how much Celtic have faded from relevance in European football. Peter Lawwell, the chief executive, doesn't thank you for saying that they have downsized but that is exactly what they have done. Maybe it's been by necessity. Maybe it's entirely prudent. But the reality is unarguable. They are now back in Amsterdam. Same opposition, same stadium, different competition. Ajax have fallen off the pace in Europe also, but they haven't fallen as hard as Celtic. Ajax made the Champions League group stages last season - and for the four seasons before - but won only one of their group games last time around. They dropped into the Europa League, beat Legia Warsaw (Celtic's conquerors) 4-1 on aggregate and then exited at the hands of eventual finalists Dnipro on the away goals rule. They are currently top of the Eredivisie, inspired by two young strikers who might well join the cast of players who have been nurtured in Ajax before finding more fame and more fortune elsewhere. The two are Anwar El Ghazi, the 20-year-old with six goals in his first five league games of the season, and Arkadiusz Milik, the 21-year-old Pole, who has been terrific in the Euro 2016 qualifiers, scoring against Germany, Scotland and Georgia. Two years ago Lennon was apoplectic at a 1-0 loss. Would Deila react the same way should history repeat on Thursday night? Unlikely. Given the confusion that has taken hold of Celtic's defence - 12 goals conceded in their last seven games and many of them hopelessly soft - and the lack of bite and leadership in their midfield then a one-goal loss could be seen as damage limitation. These are difficult days for the Celtic manager. Too many of his players are off-form, too many of his substitutions are questionable. There's too much vulnerability and the only momentum he has right now is backwards. Aberdeen are proving an early-season pest to Deila. He knew that Europe would be a struggle but probably didn't reckon on the Dons coming out of the blocks so strong and adding to his burden. Few people would back Aberdeen to stay the course and dethrone the champions, but the longer they keep strong the more anxious those in power at Celtic will become. They say that there is nothing to worry about now, but Deila needs to start giving Lawwell and Dermot Desmond some reassurance that all will be well.